Just the name "United Kingdom" implies that at one time the kingdom was not so united. Even casual observers know that many folks in Northern Ireland would like to secede from the United Kingdom and join Ireland. But fewer people are aware that Scotland also has it's share of separatists who want to create a independent nation of Scotland. Reading about this in the Globe and Mail, I was surprised there was no map, but I guess everyone in the U.K. knows where Scotland is. But us Americans, we need a map. 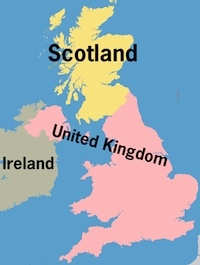 So here's a map of what the British Isles would look like under the separatists plan.